Jewish visual arts date back to the biblical Bezalel, commissioned by God to create the Tabernacle in the wilderness. Since then, Jewish visual arts have flourished, bearing the imprint of Jewish wanderings around the globe. Jewish art divides into categories of: folk art, such as paper-cuts; ritual art–artistic renditions of ritual objects; and art by Jews, which encompasses a broad range of visual expression by Jewish artists, from painting to sculpture to avant-garde art. Words and ideas have always been a focal point in Jewish life, but fine arts and handicrafts have played a prominent role as well. The Jewish attitude toward art has been influenced by two contradictory factors: The value of hiddur mitzvah (beautification of the commandments) encourages the creation of beautiful ritual items and sacred spaces, while some interpret the Second Commandment (forbidding “graven images”) as a prohibition against artistic creations, lest they be used for idolatry. With the age of Enlightenment in Europe, Jewish artists left the ghetto to become prominent artists worldwide. In their visual arts, Jewish artists displayed varied relationships with their Jewish identities, and some Jewish artists did not incorporate their Jewishness into their artistic work at all. With the rise of such artists came the question of what constitutes “Jewish art,” a question still debated today. 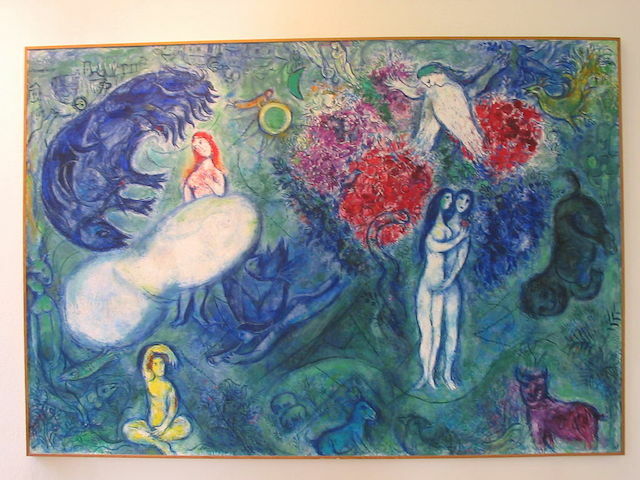 Some artists, such as Marc Chagall, clearly drew upon their Jewish heritage for their work. For others, such as Camille Pissaro, Judaism was tangential or even irrelevant to their work. Regardless of how one might define “Jewish art,” Jewish artists — painters, sculptors, and others — have flourished in North America, Europe and Israel. Jewish folk art has pervaded Jewish homes and synagogues for centuries. This has included the mizrach, an emblem placed on the eastern wall of the home to remind family members which way to direct their prayers; the shivitti, an adornment in the synagogue intended to focus attention; and the art of micrography, which uses sacred words and texts to create drawings. Artistic ritual art has included kiddush cups, mezuzot, candlesticks, and more. These art forms were once an expression of folk-piety by Jews who worked without the benefit of artistic training. Today Jewish folk art has grown in sophistication as trained artists focus their skills and sensibilities on these traditional crafts. From the beginning of the 20th century, visual arts in Israel were emblematic of the unique encounter between East and West in Israel. Artistic visual expression was enhanced in Israel in 1906 with the founding of the Bezalel Academy of Arts and Crafts in Jerusalem. 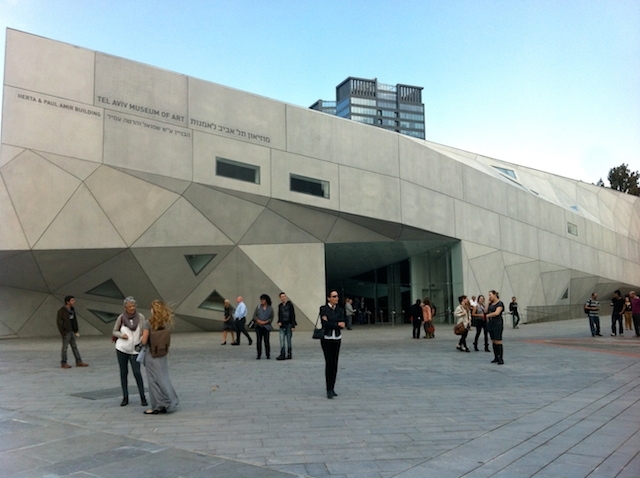 The school aimed to create an “original Jewish art” by blending European artistic techniques with Middle Eastern influences. Artists from this school — along with other artists who were part of the burgeoning visual arts movement — created paintings of biblical scenes depicting romanticized perceptions of the past linked to utopian visions of the future. Examples of such artists include Shmuel Hirszenberg, Anna Ticho, Nachum Gutman, Mordecai Ardon, and Reuven Rubin. As the State of Israel has matured, so too have its visual arts. Yaakov Agam has attracted international attention for his unique use of shape and dimension. As Israel has continued to attract Jewish immigrants from around the globe, they have brought with them their artistic training and sensitivities shaped by their host culture. Throughout Israeli history, the visual arts have been used to interpret and make meaning of the difficulties of Israeli and Jewish history.